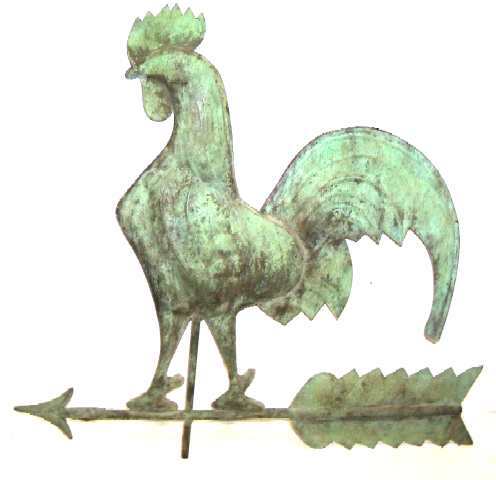 Presented here is a wonderful Full-Bodied Copper Rooster Weathervane. It is in excellent condition with only one tiny split in the bottom of the directional arrow. It sports the best all over untouched verdigris surface. Because weathervanes were designed to perform a functional purpose, their development as an art form was gradual and unintentional. This is true of all naive art. Function defined form and in most cases objects commonly found inspired the Folk Artists who made them. This weathervane, though it has a fairly common motif sets itself above the rest because of its wonderful patina that speaks of its age and use. Size is 24" long and 21-1/2" tall.